Much of the area between the Gulf and Avenue L between 20th and 23rd street was covered by a body of water known as Hitchcock’s Bayou. This water was probably the reason that camels destined for government service in the arid regions of west Texas were quartered in San Jacinto in the 1850s. The camels were held in pens at what is now the southeast corner of 23rd Street and Avenue M, the recent location of O’Connell College Preparatory High School . Hitchcock’s Bayou was “lost” when they raised the island. 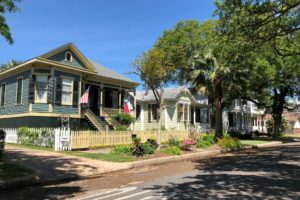 A subset of the larger San Jacinto neighborhood, the Lost Bayou Historic District was created in 1994 with an additional non-contiguous block added in 2004. 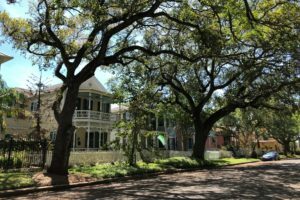 The Lost Bayou Historic District is bounded by 16th and 21st Streets on the east and west, and Avenues K and M 1/2 on the north and south. The area was developed originally as a working class community, with a smattering of grand houses and country estates. 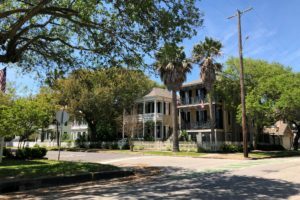 What remains in Lost Bayou is an extraordinary sampling of homes not lost at all — Greek Revival, Italianate, Arts & Crafts, and Folk Victorian architecture – preserved from the late 1800s and early 20th Century.